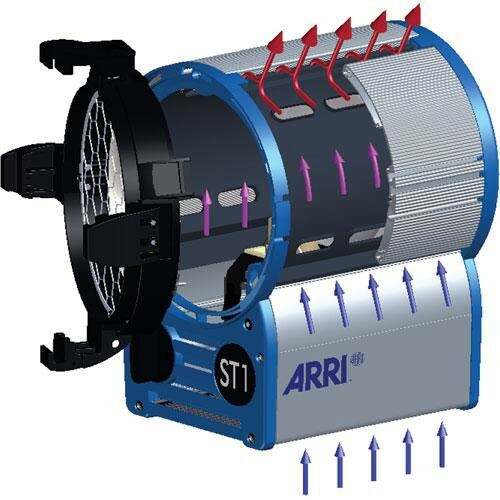 The Arri ST True Blue Series of tungsten Fresnel lighting fixtures represents a major update of this well-known industry standard. Feedback from respected lighting professionals combined with advances in technology enable Arri to present a selection of Fresnels with over 30 new improvements for studio and location lighting. Reduced weight, compact size and maximum light output are the most obvious improvements. Arri's patented cross-cooling system, which encourages a stream of air to pass around the Fresnel lens and into the lamphead from the front, has reduced the lamp housing temperature of True Blue units by 25% and the lens temperature by 17%. When fitted with a 1000 watt bulb (available separately), this fixture will provide a 13°, 3' (0.9 m) wide beam of 532 fc from a distance of 13.2' (4 m) at full spot. At full flood, it will throw a 94.5 fc beam 57°, (4.3 m) wide from the same distance. Box Dimensions (LxWxH) 18.5 x 16.0 x 15.25"